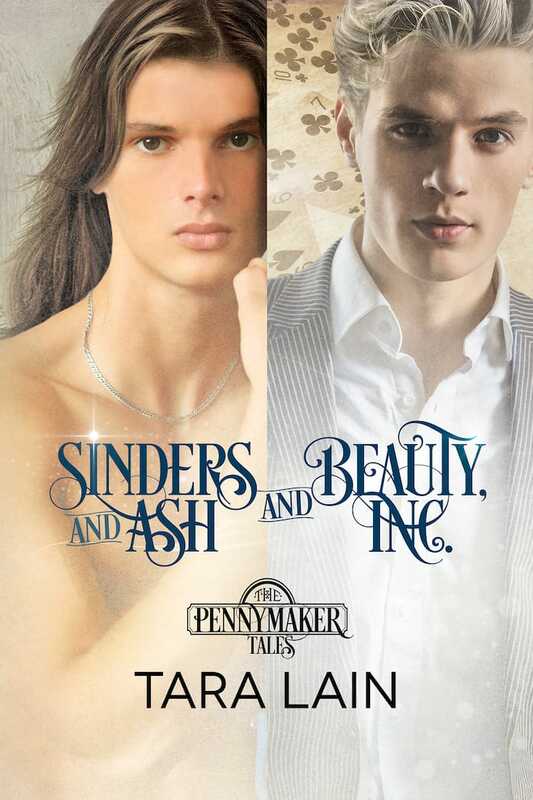 Sinders and Ash and Beauty, Inc. In an upscale resort, housekeeper Mark “Sinders” Sintorella works hard to save money for fashion school, but one look at Ashton Armitage, son of one of the wealthiest men in America, turns his world upside down. Ash is at the hotel to find a wife or lose his inheritance. Though he’s secretly gay, he’s wildly attracted to a beautiful, mysterious girl—not realizing she’s actually Mark wearing his own designs to impress investors of Mr. Pennymaker. When the clock strikes twelve, two beautiful princesses line up for the wedding, but whom will the slipper fit? Chemist Dr. Robert “Belle” Belleterre dedicates himself to developing a new product to help put his father’s small cosmetics company on the map. Sadly his alcoholic, gambling-addicted father loses Belle in a poker game to Magnus Strong, the CEO of Beauty, Inc.—a man infamous for his scarred ugliness. Belle is uprooted from his home, living in a crazy apartment owned by Mr. Pennymaker, and completely unprepared for his attraction to Strong. Belle fights his passion, but Strong’s scars hide goodness and humility. When Belle’s family starts manipulating his life again, the odds turn against happiness for beautiful Belle and his beloved beast. The soft knock reminded him of a cue in a bad play. He knew who it was and knew he shouldn’t answer. That insane little man gave him hope when he knew he had no hope. Only hard work. But dammit, he liked Mr. Pennymaker. He huffed, dragged himself off the bed, cleared the couple of steps to the door, pulled it open, and headed right back to the bed and curled into a ball. “Yeah.” Mark returned to armadillohood. He pushed into the marble and glass room just as Belleterre came out of a stall. He seemed to be taking deep breaths, and his high cheekbones were flushed pink. He saw Magnus and the blush darkened, which was more than any gay man could stand. Try to look natural. Magnus stepped up to the urinal and hauled it out—clearly a losing proposition, since the mere sight of the guy prompted a half-mast condition. Breathe. You’ve gotta pee or he’ll think you’ve lost it. In through the nose. Belleterre walked to the sink, pulled some paper towels from the dispenser, wet them under the water, and applied the compress to his cheeks. Belle’s lips curved just enough to cause cardiac arrest. “Honored.” He walked out the bathroom door. Magnus leaned against the sink and took deep inhalations, then managed to get it together enough to return to his table.